Players of all levels use pentatonic scales due to the accessibility of their pattern and the versatile expression they offer our solos. But if you are to get the most from pentatonic scales, you'll want to incorporate techniques such as string bending. In this lesson we focus on using bends musically in minor pentatonic - the most commonly used scale in lead solos. But we'll also increase our "spatial awareness" of related positions within the pattern in the process. This will improve your ability to target specific tones more purposefully within your phrases - a key skill in making your solos musical. As we'll discover, by using this extended pattern, we can easily access bend points to and from any tone in the scale. First we're going to label our tones. It's not so important what you name them. This is more about being able to identify related positions within the pattern. Here I'm labelling the positions with the scale's interval numbers. We have a root (1), minor 3rd (♭3), 4th (4), 5th (5) and minor 7th (♭7). Our first bend will be a whole step bend from the ♭7 to the 1. Start by playing through them as a picked sequence, resting on the 1 each time, ensuring you can jump between positions without hesitation. First, to make sure you're hitting the target pitch accurately, you can pick the target before you bend to it so your ears have a reference pitch for the bend. This is obviously just for practice as you'll eventually want to be able to bend to pitch without this reference. Side note: In tab form, a bend is typically written as "b" followed by the equivalent fret of the target pitch. So 10b12 means "bend from the 10th fret to the equivalent pitch of the 12th fret". These are all good exercises for both building finger strength and targeting bend pitches accurately within a larger sequence. These three whole step bend points are a good place to start with creating expressive, improvised licks from the minor pentatonic scale. 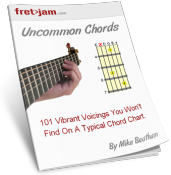 They're versatile enough to work over most minor key chord changes and conveniently touch on various natural colour tones within a minor key progression. So even though we're using minor pentatonic as our core scale, occasionally touching on these outside tones can give your pentatonic licks more colour. Let's now take a look at some half step bends, which are a bit more subtle, but can still add more expression to our licks. Bending a half step (or semitone) is the equivalent of one fret. Here I'm bending from the 2nd to the minor 3rd - a strong target tone that sits naturally over most chords in a minor key. On the subject of blues, often minor pentatonic is played over a sequence of dominant 7th chords. So on the tonic of a typical blues progression we'd have a major 3rd (3) voiced in the chord. We can complement this by bending the ♭3 up a half step to the 3. Finally, let's look at a couple of larger bends - the equivalent of one and a half steps or a minor 3rd interval. Now, these bends will take a bit more practice, as they require more strength to reach the target pitch. However, used sparingly, they can give your licks that extra level of expression. They're also a good way to stretch out new strings! Practice these bend points individually to start with and then gradually start to combine them in your licks. The more you play around with different combinations and approaches, the more quickly your eyes and ears will connect where your fingers are in the pattern with what you want to express in your lead. In general it's useful to think of lead phrasing in terms of target pitches. You can then try different ways of approaching these targets, whether using a bend, slide, hammer-on or a straight picked sequence. By becoming more aware of these targets, and anticipating them as you play your licks, you'll find it's not so important where you start your bend, rather hitting the target pitch accurately and with purpose. However, the bend points we've looked at can be thought of as familiar reference positions around the scale pattern for approaching your target pitch. I hope you continue to find this lesson valuable as your string bending develops and you incorporate it more naturally into your lead playing over the coming weeks, months and years.